What a difference a week makes! 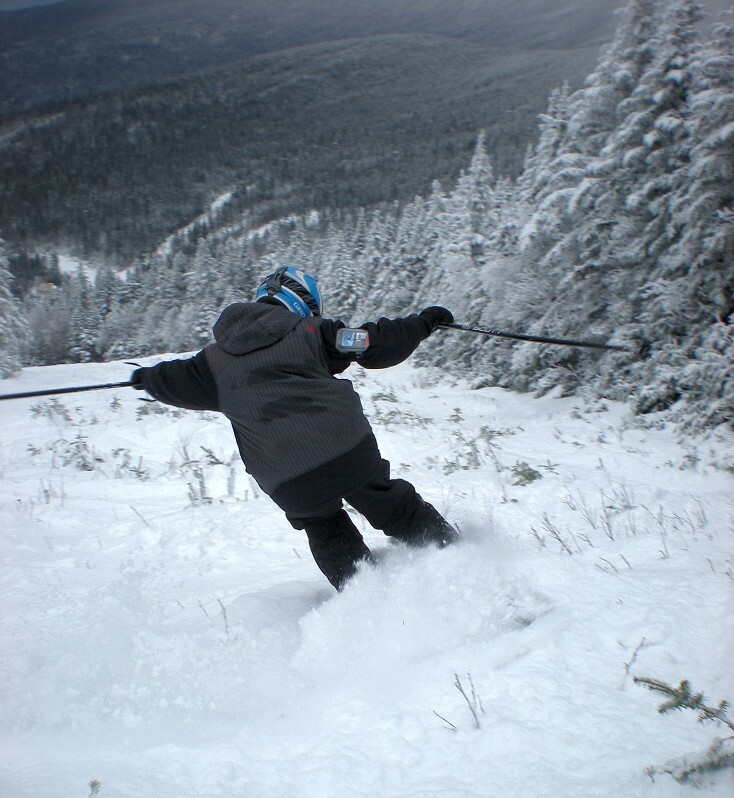 Saddleback has been picking up an inch or two every day over the past week and it all added up to much improved conditions at Saddleback when compared to the previous weekend. They even started to get some of their natural snow trails open including Peachys Peril and Golden Smelt. 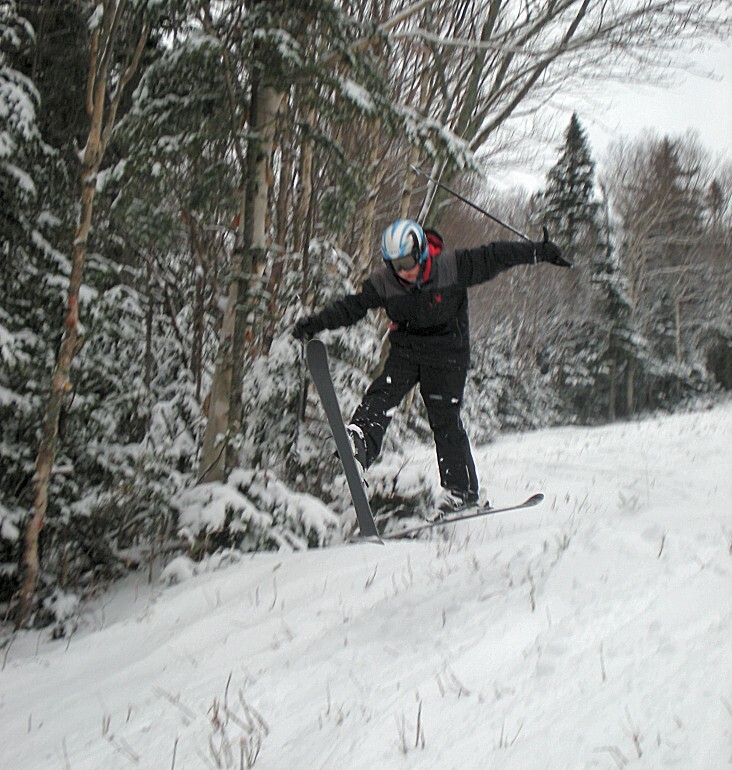 They have two new groomed runs down the mountain in Blue Devil and Silver Doctor. You can check out my guide to all 66 Saddleback Trails here. Overall conditions were very good. Grey Ghost, Green Weaver and Blue Devil skied great. Silver Doctor just opened so it had that 'brand new snowmade" feel to it. 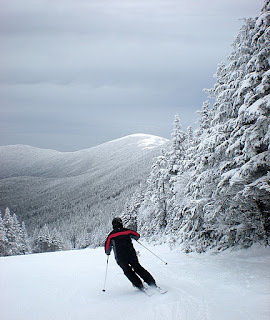 A bit wet and stiff underfoot but definitely very skiable. The natural trails offered adequate cover early in the day. Peachy's Peril held lots of new snow and Golden Smelt was good too. 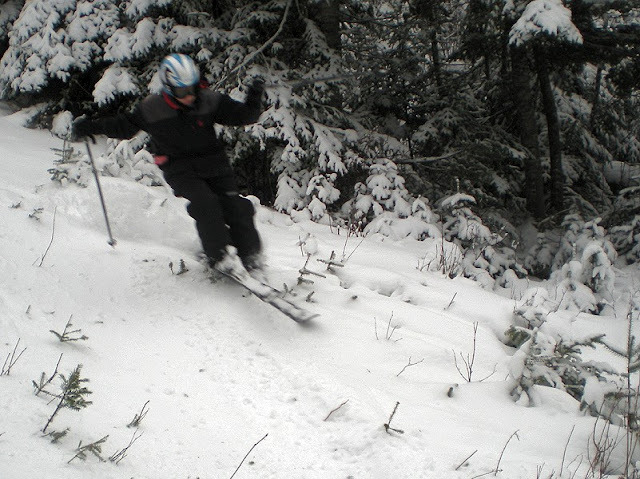 You had to ski around some scrub but there was enough snow to make confident turns. Later in the day these trails wore down with skier traffic exposing more obstacles but good on Saddleback for providing new ways down the mountain. There was a decent crowd there. 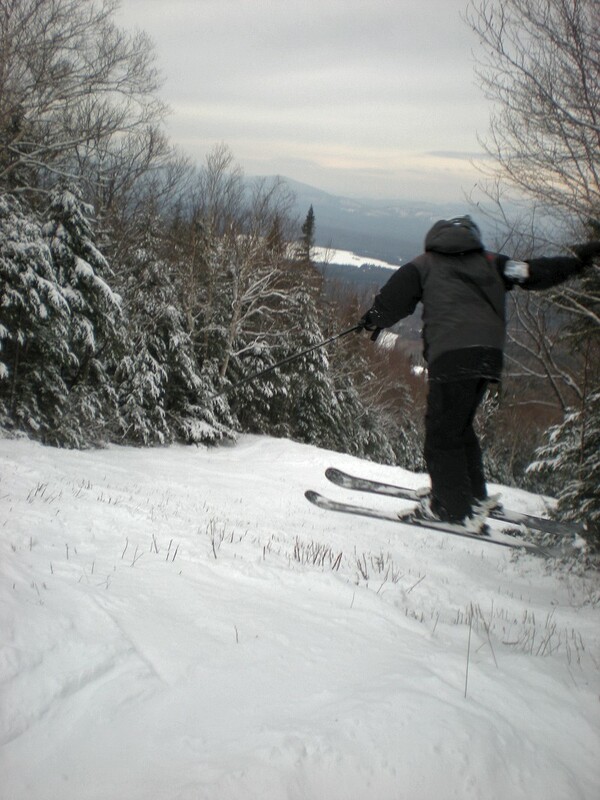 With only the Rangeley chair open (no T-Bar or upper Quad yet) it put a lot of pressure on this double chair. So lines were 10-15 minutes most of the day. The lower beginner Quad and the terrain park double was ski-on all day. With $29 Maine day tickets tomorrow, I bet they will have a bigger crowd and potentially longer lines. 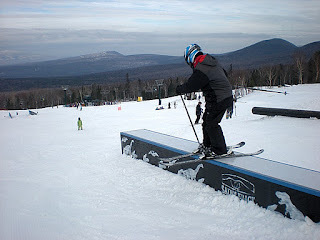 The terrain park was set up very nicely offering a nice diversion for my youngest in between rides up the Rangeley. Nice to see winter back on the mountain! They had a snow dance outside the lodge to bring us more snow! Dance hard cause the upcoming mid-week storm looks too warm for my liking but there is still time to convince the snow gods otherwise!